Throughout the history of naval warfare, two factors have greatly influenced tactics: weapons development and the increasing range between opposing navies from which destruction could be delivered. In the galley era, in which ships were mainly propelled by rowing, the primary weapon was the ram. 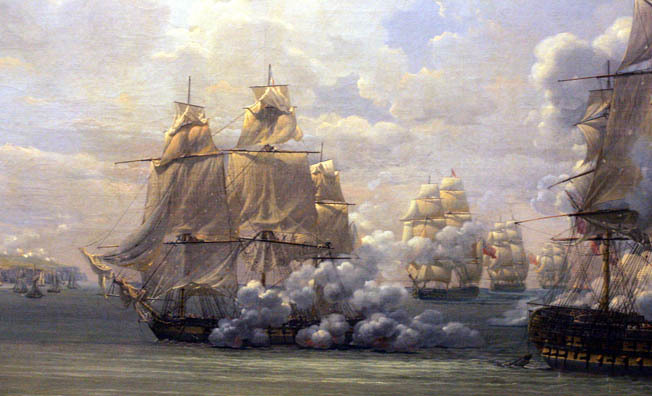 Opposing navies approached each other head-on and, once engaged, the enemy would board. Although early firearms were mounted on ships by the end of the galley era, the ships could not support cannon large enough to determine the outcome of the battle. By the 1500s, ships were large enough to carry a sufficient number of cannon to force a change in tactics. During this age of “fighting sail,” strong, large-sailed ships with multi-leveled rows of heavy cannon engaged each other broadside fashion in a single line to bring all of their firepower to bear. Eventually commanders such as Admiral Horatio Nelson  learned to form their ships of the line into two battle groups to effectively disrupt the enemy’s line, break it into separate parts, and defeat the parts in detail. At the beginning of the 20th century, the use of torpedoes and long-range guns forced commanders to engage enemy ships from thousands of yards away. With advanced fire-control capability  and rotating turrets, the battleships of the day could effectively destroy enemy ships while maneuvering at fast speeds. The most desired tactic in battle was capping or crossing the T, in which a ship is positioned perpendicular to the enemy, allowing all of its guns to bear while receiving only forward guns from the enemy. Ideally, a commander tried to concentrate all the firepower in his line against the enemy’s line while reducing the enemy’s ability to return fire. As opposing forces approached each other, one column would steer to either port or starboard, allowing all guns to fire on the head of the enemy’s line. Minimal return fire was expected since only a few of the enemy’s guns could sight on the ships capping the T. Speed was critical to the success of this maneuver. During the Sino-Japanese War in 1905, Russian Admiral Zinovi Rozhdestvenski was ordered to the seas off the coasts of Korea and Japan with 45 ships to defeat the Japanese fleet commanded by Admiral Heihachiro Togo. In the Battle of Tsushima Strait , Admiral Togo crossed the T twice in his fight with Rozhdestvenski. Taking advantage of speed and firepower during the battle that continued into the night, Togo sank and crippled all but 12 of the Russian ships. Operating in loosely independent divisions, the Japanese were able to demonstrate the importance of uniformity in regard to ships, gun type, and tactics, which allowed them greater flexibility in battle. In the Battle of Jutland  during World War I, British and German fleets opposed each other in the hallmark naval engagement of the war. During the course of the battle, British fleets crossed the combined German fleets twice. In a battle whose victor is debatable, the Germans were twice subjected to heavy bombardment but were able to return to port. Although Britain lost many ships, she was able to shake off the losses and return her damaged ships to sea in a short time. Commanders continued to strive to cap the enemy’s T in subsequent battles. By the time of World War II, aircraft carriers were changing naval tactics again, but not enough to prevent U.S. Admiral Oldendorf from famously defeating his enemy force by performing a textbook naval maneuver in the Battle of Surigao Strait .